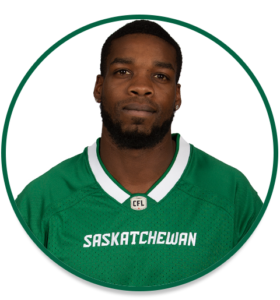 PRO: Signed with the Riders in April, 2018…signed as an undrafted free agent with the NFL’s New Orleans Saints in May, 2016. 2018: Started 17 regular-season games and the Western Semi-Final…registered 764 yards and four touchdowns on a team-leading 62 receptions… recorded two 100-yard receiving games (152 – Aug. 19 vs. CGY; 113 – Oct. 20 vs. CGY)…added one catch for one yard and one carry for nine yards in the playoffs…named CFL Top Performer for Week 10…named West Division Most Outstanding Rookie…named Riders’ Most Outstanding Rookie. COLLEGE: Played four seasons at Ball State (2012-15)…recorded 200 receptions for 2,723 yards and 24 touchdowns in 44 career regular-season games with the Cardinals…left Ball State ranked fourth all-time in school history in both catches and receiving yards and was tied for third in touchdown receptions.